Today concluded week one of training for the 2018 Chicago Marathon. Since I’ve been a negligent updater, let me catch you up. I completed the Chicago Marathon in 2010, 2011, 2012, 2013, and 2014. Late in training for 2015, I developed plantar fasciitis. I had registered, but I was unable to run. I did accompany my daughter Clayre to Chicago, and I cheered her on as she ran a beautiful race. I dealt with the plantar fasciitis for about a year, getting discouraged, and continuing to gain weight. That year, 2016, was a pretty bad year for our family. We dealt with job loss, a down year for my business, and the worst day to date of our lives when we lost our precious four-year-old friend Caiden in a tragic drowning accident. None of those things are excuses, but that didn’t stop me from slipping into old habits of overeating and becoming more and more sedentary. Soon, the thought of exercising and running seemed too daunting. One thing led to another, and I found myself very discouraged and sad toward the end of 2017. When I would see people out running, a part of my heart would hurt as I recalled the feelings of freedom and accomplishment that running has afforded me in the past. Sometime in December 2017, I made up my mind that I was going to get back out there again, and that I was going to do it slowly and carefully. In discussing this with my daughter Clarye, she reminded me of the Galloway method of marathon training. She had experimented with it, and she encouraged me to check it out. She let me borrow her Galloway book, and as I was reading it for the first time, I was encouraged that I could train that way more effectively. I talked it over with some other runners, knowing that some “serious” runners don’t endorse it (what’s new? ), but I determined to give it a try. I’ve already completed 11 marathons, and for this 12th, I didn’t see any reason not to shake things up a bit, push past my objections, and try to train in a way that will allow me to enjoy not only the process but the race itself. I also joined up with a new running buddy, Steve, a fellow band parent, who happens to be the dad of my stepdaughter’s boyfriend. We knew each other casually, and when he saw that I was running, he asked me about it. He decided to start training with me, and he determined to run his first marathon this year as well. So, on January 8th, we started base training in order to be ready to begin training this past week. We started slowly and carefully. We’ve both got a substantial amount of weight to lose (I’ll speak to this later), and we wanted to be very careful about avoiding injury. 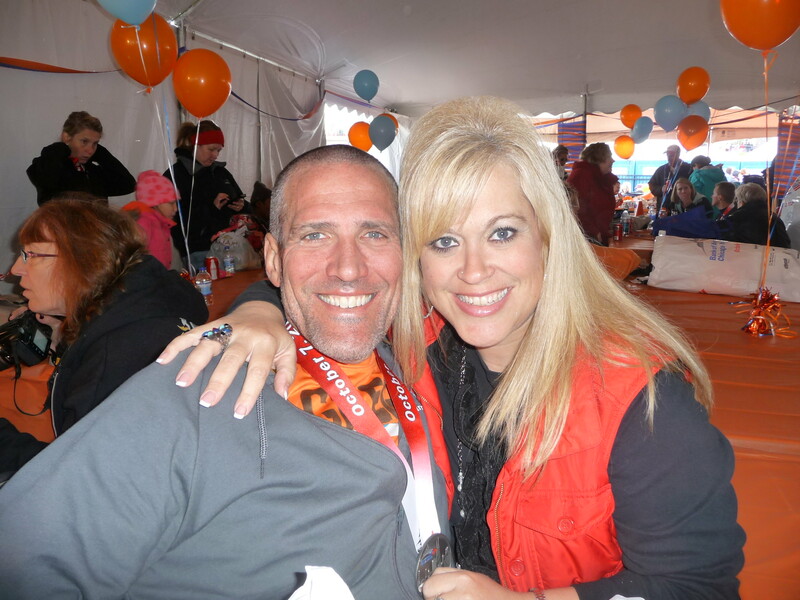 Along the way, I began sharing with Steve everything I had learned about running a marathon. By the time the first weekend of April arrived, we had extended our long weekend run to 9 miles. We built this up slowly over three months. We’ve consistently run 4 times per week, doing some walking on off days. I feel that this has been a huge success so far this year. I’m still battling the mental game of running more slowly than I have in the past. But I’m leaving that up to smart training and continued weight loss. I don’t really have a time goal for Chicago. I mean, I do, but I don’t. My goal is to finish well and enjoy the process. For the four or five of you who read this…I’ll write more about the struggles. I’m sitting here today, though, feeling like I’m on the right track for the first time in two or three years. I can only thank God and my support system, specifically, Marla, Clayre, and Steve. Steve and I are both feeling good about this first week. 25 weeks to go! I walked back up to Roosevelt and Michigan Avenue today to think about what I wanted to say in this post because that spot – the one right between Michigan Avenue and Columbus on Roosevelt..
That is the spot where my goal was made. But before I get into all that, I want to call attention to the fact that this race was about so much more than a time goal or a pace or anything like that. 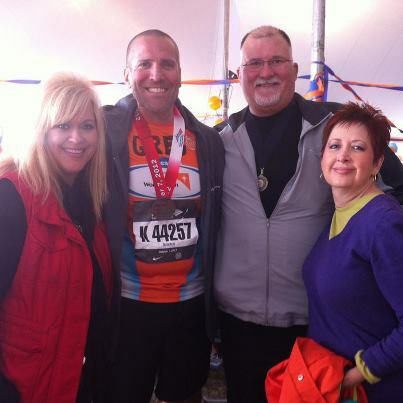 I ran this race, again, with Team World Vision. If you don’t know about World Vision, stop reading this junk and go over there now and check it out. I’m so proud of my team. Together, with the help of thousands of very generous friends, our team raised 1.6 million dollars to make a difference in the world. Through our efforts, combined with those of other generous donors that matched our gifts, over 64,000 people in Africa will be able to access clean water for life. This is something we obviously take for granted here in the USA. What Team World Vision does is really important. And for many of us who run, being able to make a difference through something that we love is an amazing opportunity and a tremendous privilege. So that is the most important thing that happened on Sunday. First off, this trip was another great trip to Chicago. 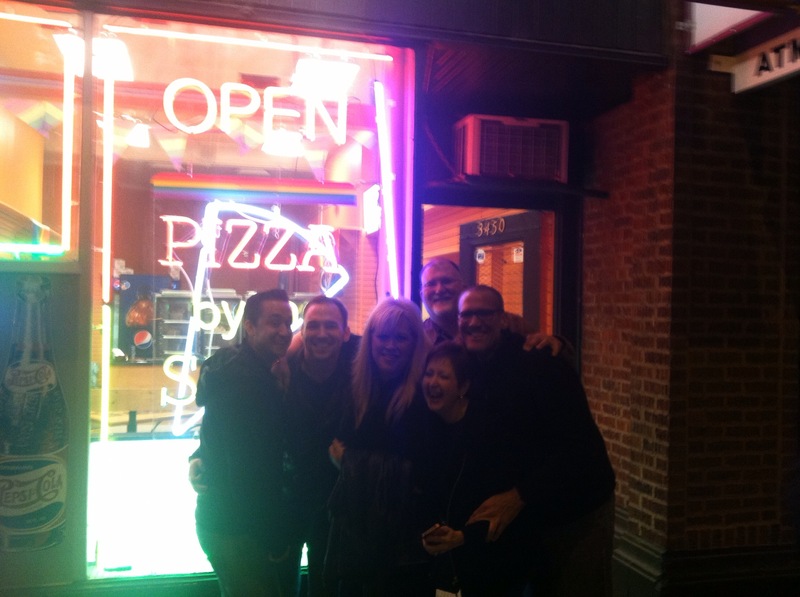 I got to share this incredible time with my great friends Mike and Lisa Maxwell and my girlfriend Marla. They were my personal cheering section, following me around the course and giving me that special adrenaline boost. So helpful and so special and meaningful. And of course we had some good times as usual. They endured the Expo with me, and went with me to the Team World Vision pasta dinner and then greeted me with hugs after the race at the Team World Vision after race party. We also enjoyed some special times with our good friends Tommy and Andy, who took us to places we wouldn’t have otherwise known about. Those guys are awesome and wonderful hosts. This was my third time running the Chicago Marathon. Certainly not my last. I love this event. 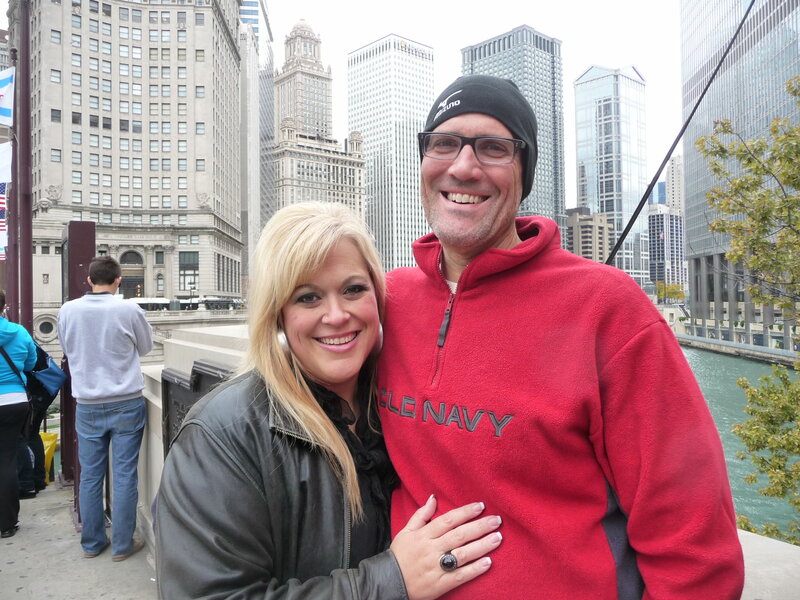 Chicago was my first marathon, and it changed me forever. I love it more each time. This year, I met and actually surpassed my goal. I’ve been chasing a 4:30 marathon for a while, and this time I made it with a 4:29:05. I am thrilled with this accomplishment, because I have been working for it for a while. I’m on now to new goals. Exciting. I got into a pace group, as usual. One of the pace leaders was a guy named Dave, who also led the 4:30 pace group 2 years ago when I was only able to hang with them for the first 10 miles or so. I remember him well. He’s fun to run with. He’s also loud, which made it easier late in the race to “feel” how close the group was to me. I started just behind them, and then stayed ahead of them from about mile 4 through the end of the race. The weather was awesome. I think it was around 40 degrees when we started. And somewhere in the 50’s when we finished. Sunlight. Breeze. Cool air. Such greatness. The spectators were awesome. I got cheered on by name for so much of the race. It’s crazy how helpful that is. The first half was fun and easy as usual. It’s really the best part of the course. Once I crossed the half, I felt fairly confident that I was going to get very close to goal. I could just feel it. I made the commitment right then that I was going to have a good second half. And I promised myself that no matter what, I was not going to stop running except at aid stations in order to get Gatorade or water. I also decided to only walk half of each aid station since they are so long in this marathon. I’d either walk through the Gatorade and start running at the water, or I’d run through the Gatorade and walk through the water. I kept my promise to myself, and that felt really good. I also decided that I would stay in front of the pace team. This became more of a challenge the farther we went. Since Dave was so loud, if I heard him talking, I would dig in a bit and try to push to get away from him. Honestly, I felt really strong until about mile 21. That was when my quads started griping at me. But I knew I had to dig deep because I actually had a shot at making my goal. Two other things kept me going in the late miles. Rusty Funk had reminded us on Saturday night that when we got to “rough patches” and we wanted to slow or to stop, that we should smile. I employed that strategy. At one point when I was doing that, one of the spectators yelled at me that she loved my attitude. That was funny. The other thing that kept me going form 21 to the end was the other thing Rusty reminded us about. That this race wasn’t really about us – but that it was about those children who, through our efforts were going to have an opportunity for life. I imagined their faces that I had seen so many times in pictures. When I got thirsty, I recalled the images of women and children walking for miles to bring filthy water back for their families. And I just decided that the course could not beat me today. That this time, no matter what, I was going to push and get there like I wanted to. I thought of my sponsored child, Gcina, and the more I thought about purpose, the harder I wanted to work. The thing about the late miles, though, is that once you start to fatigue, your perspective gets unreliable. So, what feels like the same amount of effort you were using 15 miles ago to keep pace is now producing a weaker result. In order to maintain the pace, you have to actually think about going faster, which is about the last thing on your list of things that you want to do. As I turned on to Michigan Avenue, I caught a glimpse off in the distance of a ginormous American Flag waving in the wind over the street. It was beuatiful. I thought it must be somewhere up around Roosevelt, and I decided to key in on it and run toward it with all of the effort I had left. As it turned out, it wasn’t quite at Roosevelt…and that was a little disappointing. But then, I saw the “1 mile to go” sign, and I knew that if I could just keep pace that I would make it. I heard Dave’s voice behind me saying, “No one, ever in the history of marathons has ever said, ‘I wish I would have walked more.’ Now c’mon! Dig! Let’s go!” They were right on my heels. I didn’t think I could push any harder. As I contemplated this, the corner of Michigan Avenue and Roosevelt kind of snuck up on me. There it was. 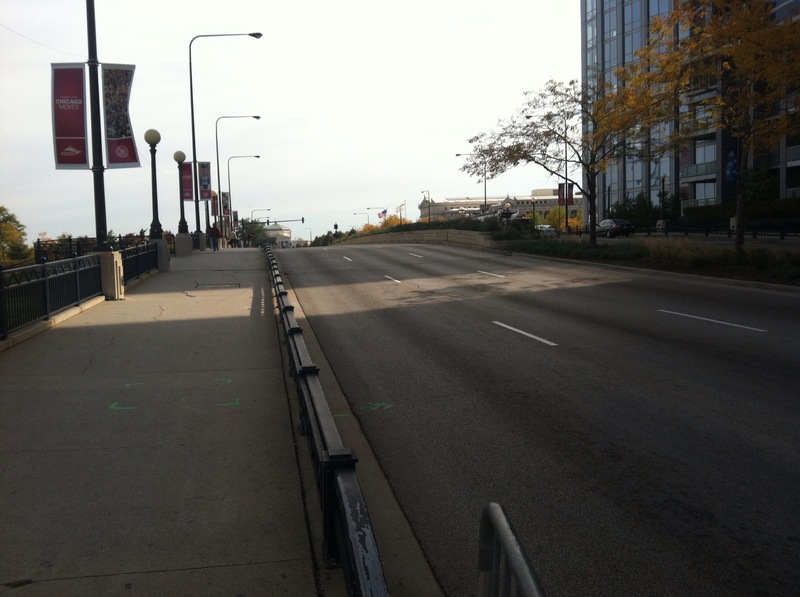 Anyone who has run this marathon knows what it feels like to see that corner. It is glorious. My friends told me later that they were there, screaming for me. But I never heard them. They told me that I looked extremely focused. The truth was, I was scared because as soon as I rounded the corner, I caught a glimpse of the pacers out of the corner of my eye. The were even with me. And then I hit the spot in the picture. I heard Dave tell the others, “Guys, we’re 45 seconds ahead. Slow down.” They did, but I didn’t. And that is when my goal was made. I did what I felt was a sprint. I’m glad it wasn’t on video, because I’m sure it wasn’t pretty. 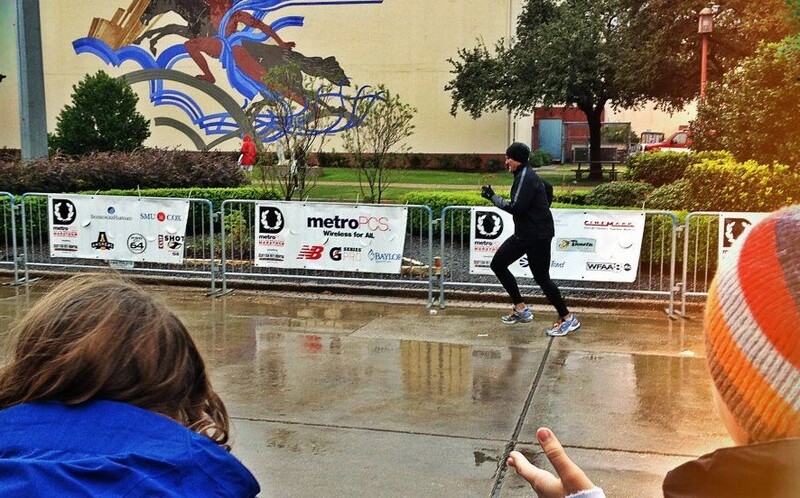 But I gave it every thing I had and I crossed that finish line 54 big seconds earlier than I planned to. And I loved it. And as usual, I can’t wait to do it again. Thank you for your encouragement and support. It means everything. I dare you to run with me next year.